What does your fortune hold? Will you swim in riches? Find out with the Fortune Tell Online Slot Game. The game includes an exciting Bonus Round where you can choose tarot cards in order to reveal prizes. 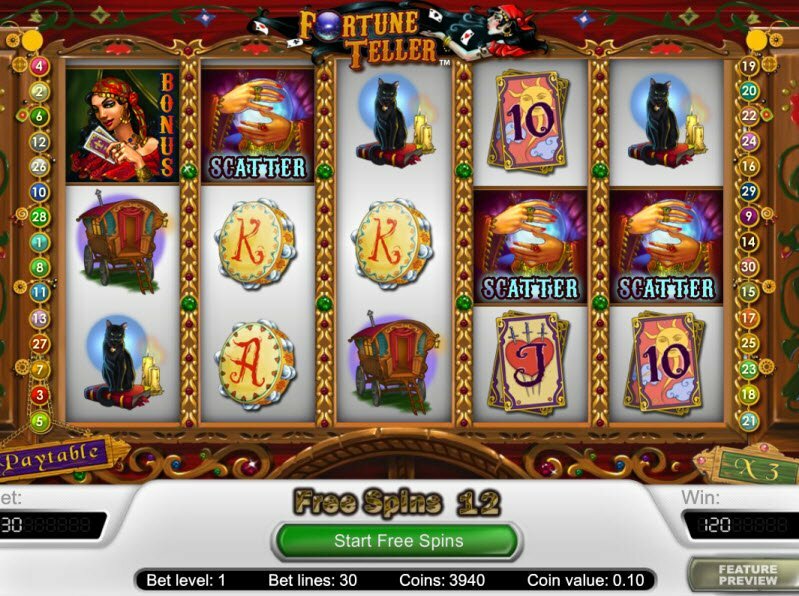 Powered by Net Entertainment gaming software, The Fortune Teller Online Slot features 5 reels and 30 paylines. Although the quality of the game graphics could improve, overall the slot machine has a very cool design and theme. What Do You See in the Crystal Ball? What does the crystal ball hold in store for you? I see reels of black cats, horses, tarot cards, tambourines, and a huge payout! 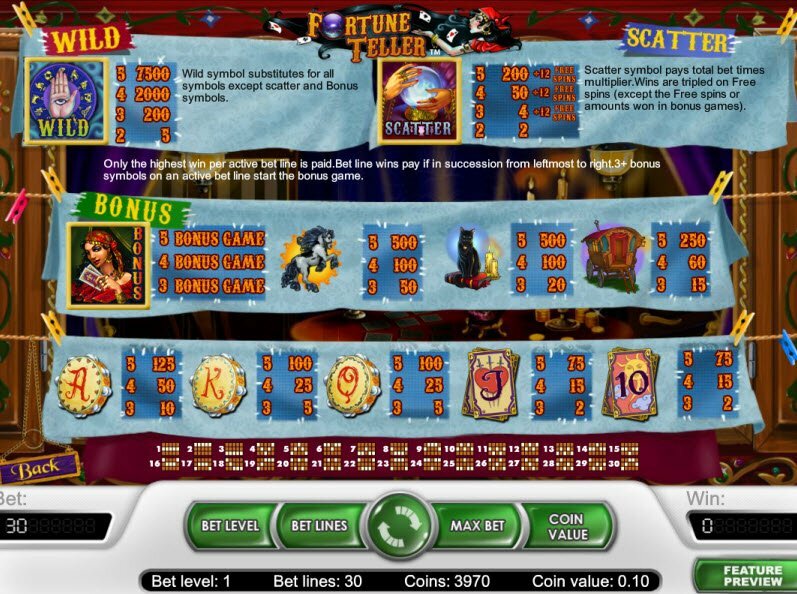 The Fortune Teller Slot software features good-quality graphics that take you behind the curtains of a gypsy fortune teller. The thematic sound effects that accompany the game include eerie sounds of creaking and wind chimes. You’ll love the mystical atmosphere of this slot machine. What does the crystal ball hold in store for you? I see reels of black cats, horses, tarot cards, tambourines, and a huge payout! You could make a fortune with this online slot machine. The Fortune Teller Slot bonuses include several alluring features to keep the game exciting. The Wild Symbol represented by the hamsa substitutes for all symbols except Scatter and Bonus Symbols. The crystal ball serves as the Scatter Symbol which pays total bet times multiplier. Wins triple during Free Spins. The symbol you really want is the Gypsy Bonus which triggers the Bonus Game. 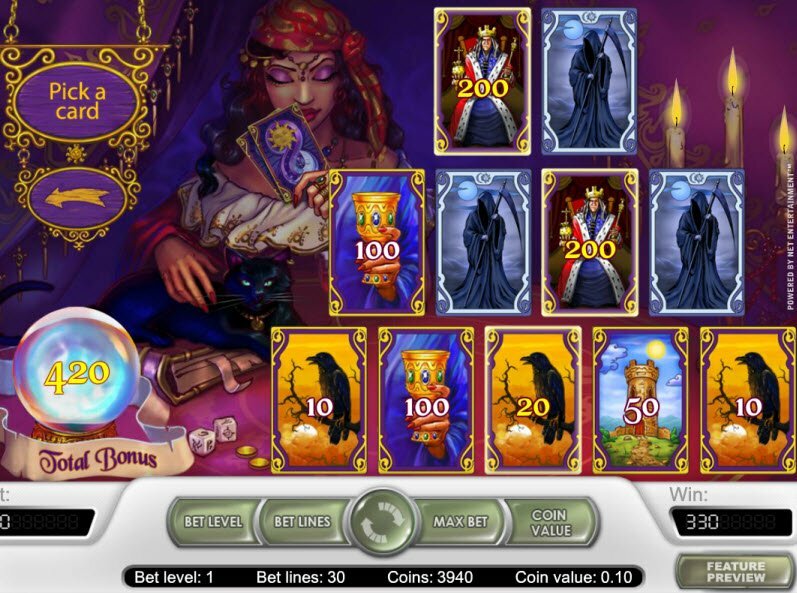 During the Bonus Game, you choose different tarot cards to receive payouts.